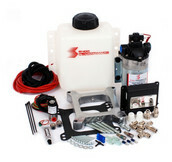 You've already made a great decision in equipping your vehicle with a Snow Performance methanol injection kit.. Now you need to take it a step further by customizing it to your needs. Need a larger reservoir? No problem! Need a different nozzle? How about a level switch? No problem! You've come to the right place..